This Belratti review was made after playing the game six times. We were sent a copy of this game by the publisher in exchange for an honest review. 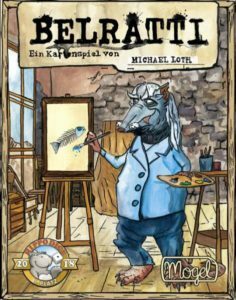 Belratti is a cooperative deduction card game in which you’re attempting to prevent a famous art forger from getting his paintings into a museum. The game was designed by Michael Loth and is published by Cheat Publishing. During each round of Belratti, some players will be the museum managers (cats) while the other players will be the painters (owls). 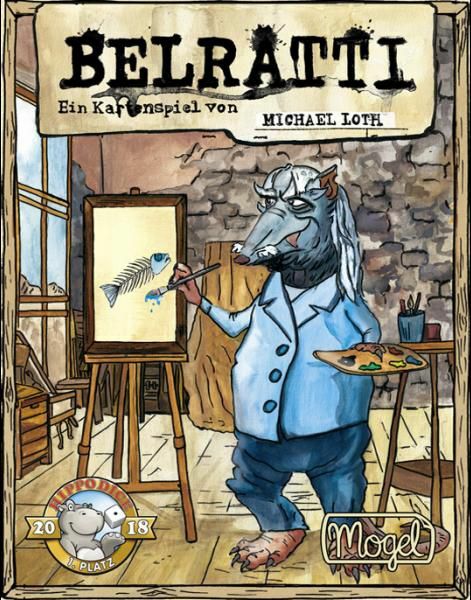 The museum managers tell the painters the types of paintings they want and it’s the painters’ job to pick good paintings so the art forger, Belratti (rat), doesn’t get his fakes into the museum. Each round two theme cards will be placed on the table representing the types of paintings the museum managers want. The museum managers will ask the painters for 2-7 paintings that match the theme cards in some way. The painters might choose paintings based on their shape, color, or a theme that matches one of the two cards on the table. The painters can tell each other how many paintings they think they can add to the pile, but they can’t say anything specific about what’s in their hands. After the painters have collectively added in the number of paintings the museum managers asked for, those cards are shuffled together with four fake paintings that Belratti made and the museum managers have to figure out which ones the painters made. They do this by choosing paintings and putting those cards underneath the two theme cards. The museum managers then ask the painters if the paintings they chose are the real ones and if they are underneath the correct theme cards. Each one that checks both of those boxes goes into the success pile. Belratti’s fakes go into his pile. The paintings that were put underneath the wrong theme cards are simply discarded. If a round ends and Belratti has gotten six of his forgeries into the museum, the game ends and you will get a score based on how many paintings you successfully got into the museum. Otherwise, you shift the role cards one spot clockwise and start a new round. There are also two joker cards for the museum managers and two for the painters in the game. The managers get an ability to exchange theme cards and an ability to ask the painters if one of the picture cards is theirs. The painters have an ability that lets them raise or lower the number of paintings they turn in during a round and an ability to swap six cards from one hand with six from the draw pile. These joker cards can be flipped to activate their abilities and you can get them back by getting a perfect score during a round. Check out our Top 5 Limited Communication Games! Easily the best thing about Belratti is seeing how players work out ways to make their cards match the theme cards on the table. Sometimes the painters just don’t have great options so they are forced to think outside the box, which is great. I like that the roles change from round to round. It keeps the game from feeling too repetitive by giving you different jobs to do and by allowing you to team up with different players. The joker cards were a cool addition. It’s nice to have the option to use those abilities when you don’t have good theme cards or even when you feel like you have a really good hand of cards. I’ve played Belratti at the three, four, and six-player counts and each group had a good time playing it. I definitely prefer it with more players, but it has pretty much the same feel no matter how many people you play with. I think it’d actually work as a two-player game, too. Belratti can have a very small footprint if you need it to. I could see this being a great game to play during a lunch break. You can get pretty unlucky with the cards that Belratti adds each round. He could just randomly add paintings that work a lot better than the ones the painters selected and there’s nothing you can do about it. Sometimes that creates some funny moments, but it can also be pretty frustrating. I don’t mind the look of the cards, but I don’t think they look like paintings. They look more like photographs to me. I’m not surprised that Belratti has gone over well with everyone I’ve played it with considering that pretty much my whole group enjoys limited communication games. This one has more of a party game vibe than games like The Mind and Cahoots, but I think people who like those games will end up being fans of this one as well. 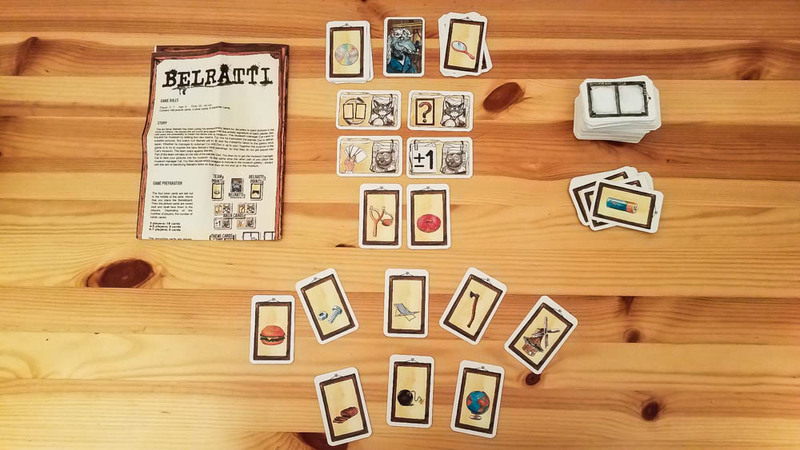 Belratti isn’t one of my favorite limited communication co-ops, but I definitely have enjoyed playing it. I like the original theme, both roles are fun to play, it’s highly portable, and I’ve had a good time trying to beat my past high scores. I could see this one hitting the table at least a few times a month for the foreseeable future. Thanks for taking the time to read our Belratti review! To stay updated on all things cooperative board games, follow us on Twitter, Facebook, or via RSS.